Making the most of your Disney trip shouldn’t be stressful or complicated. There isn’t a science to it. Nor is there a magical spell or a song to recite to get there. It doesn’t matter if you’re more into Pocahontas, Aladdin, or Toy Story. Regardless of which park you and your family prefers, the only constant for finding the best times to go to Disney is having a proper plan and peace of mind. Peace of mind in assembling an itinerary, getting there, experiencing the most of what there is to offer, and maximizing the enjoyment that can only come from visiting the happiest place in the world. Planning a Private VIP Disney tour can ensure that these needs are met, giving you more time to play with Mickey and less mess like the beginning of Fantasia. 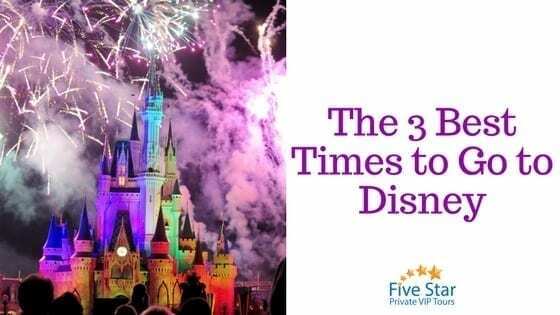 By taking advantage of the benefits offered by our Private VIP Disney tour, here are the three best times to go to Disney. Rome wasn’t built in a day, neither was the ultimate Disney experience. There is simply to much to fit into one day. It’s impossible within 24 hours to go down Splash Mountain, up Space Mountain, across the Test Track, through Hollywood Studio, within the Magic Kingdom, and back through Spaceship Earth. Disney World contains a whole universe of wonder, if you rush you might just miss it. Planning a tour for two or more days is not only beneficial, it’s recommended. We encourage this by offering a 10% discount when booking our tour for two or more days. It’s the only way to make the most of your time there. Longer lines can lead to significantly less desired wait times. These waits can be taxing and can take away your total potential enjoyment of the happiest place on earth. Not only that, but knowing that there will be lines can be discouraging toward booking a trip on a holiday. Disney can be a spectacular place to be to celebrate New Year’s, Easter, Christmas, The 4th of July, Thanksgiving and more. It’s not just inside the park either, getting there can be a struggle with all the traffic and movement associated with everything in Orlando at that time. You also might find unscrupulous timeshare scammers in Orlando. Make sure you know how to cancel a Florida timeshare. Booking a Private Disney VIP Tour can make your holiday trip more momentous with our luxury transportation to get you to and from the park alongside our fast pass to skip the lines and get more rides. Not to mention several of our tour guides are former Disney employees themselves, with an insider knowledge of the park capable of knowing what every holiday has to offer. Aside from Holidays, Disney has special events of their own throughout the year. The winter has various holiday celebrations such as Mickey’s Very Merry Christmas Party at Magic Kingdom or the Candlelight Processional at Epcot. Spring has the Flower and Garden Festival at Epcot, a magical adventure within its own right. You may also want to explore a summer tour while the kids are out of school, where special events related to Frozen and Star Wars are on the horizon. The Fall also has the Epcot International Food & Wine Festival, which is self-explanatory in terms of excellence. Our tours are assembled by former Disney insiders who know exactly how to make the most of visiting Disney during a special event. Disney World serves awesomeness around the clock. It’s important to plan to make it the most fun time possible for your family. With Five Star Private VIP Tours you can get there in style with no stress, make the most of your holiday visit, and capitalize on the special events. If you’re looking for a stress-free adventure for you and the family, contact us at Five Star Private VIP Tours for the most excellent experience possible.